March 27, 2017 –London-based design company, Tangerine, has joined forces with Bradfor, IPC Mouldings and Magnesium Elektron in a collaboration intended to demonstrate what is possible when companies use their respective skills to work together and create a ready-made supply chain. Bradfor is a seat cover manufacturer, IPC Mouldings is a plastic injection molding company, and Magnesium Elektron is a manufacturer of magnesium – an interesting material since the latest revision to SAE standard AS8049 removed the magnesium ban. Over a period of just eight weeks from original concept to completion, the four companies worked together to deliver a concept seat named Poise, with each partner applying its own particular area of capability. 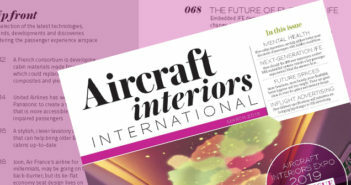 Details of the design are scarce ahead of the reveal of the seat at Aircraft Interiors Expo on April 4 (on the Northern Ireland Stand), but the images above and below give an idea of what to expect, and Dan Flashman, creative lead at Tangerine, hinted at what to expect. “Poise rethinks the structure of the economy class seat to enhance the passenger experience, creating extra legroom for every person, irrespective of where their seat is positioned relative to the seat track. Creating the seat design around delivering this small innovation will have a significant impact on the level of comfort enjoyed by the passenger. 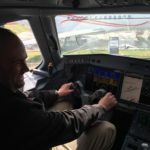 Other features such as extended headrest wings and magnetic meal tray are only made possible by the close collaboration and buy-in from the key stakeholders,” he stated.